This free guide will show you how to “really” tune a piano with an inexpensive tuner. If you want to tune your own piano and have a decent chromatic tuner, this articule is for you. Reality check: M ost piano tuning tutorials you see on the internet that pretend to show you how to tune a piano with an ordinary cheap tuner are fundamentally wrong, misleading at best, that is a fact. If your idea is to tune your piano armed with a chromatic tuner and a chart of the 88 theoretical piano pitches, sorry to dissapoint you, but things do not work that way. I know you probably dont believe me, so I encourage you to try (as they say, seeing is believing) anyway that will be a good exercise! Before going any further let me point this out; A piano (any piano) can not be properly tune at least a “temperament” is set in advance either by aural or electronic means. Ok, but what is the “temperament”? The temperament could be defined as a group of notes in the center of the keyboard (approximately one octave) that are tuned in a certain way. Once the temperament is set we will use it as a reference to tune the rest of the keyboard. Really what this articule is all about is to show you how to set a temperamente with a chromatic tuner. Given that every note at the piano has a theoretical perfect pitch (for example A4 = 440 htz) it could be assumed that to tune a piano all you have to do is to tune each note to those theoretically perfect pitches. Unfortunately this is not true and whoever has tried that way, will agree that the outcome is rather disappointing. So, can you tune a piano with a low cost electronic tuner? The answer is Yes, but also No!! It all depends on how you do it. 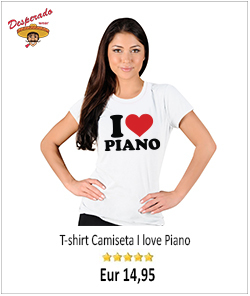 There are specific electronic piano tuners and software, but the cost of these are quite high. Unless you are going to tune many many pianos they are not worth buying, so if you have an old Chromatic Tuner anywhere, rescue it, maybe you can give it a second life. Let me say that those for tuning guitars are not useful, also better if the tuner is of a certain quality. the one at the pic works quite well. Incidentally, I dont sell electronic piano tuners neither have any commercial interest in them. As far as I know, this is the first time on the internet that a method for setting the temperament and by extension to tune a piano with a simple Chromatic Tuner is clearly exposed. So, patient readers and friends hold your breath, the secret is going to be revealed…. Using the procedure that follows you can set a basic and could we say “acceptable” temperament. Let me warn you that the process is slow as you must recalibrate the tuner at each note. I would recommend nervous and impatient people better to abstain. First thing you have to do is to calibrate the Chromatic Tuner to A-4 440 (standard tuning pitch). This means that the A4 ( A above middle C) should vibrates at 440 htz (pulses or beats) per second. Now using a felt strip mute each side string of the unisons ranging from F33 to F45 (the temperament range). Look the picture below. You have already determined the exact amount of stretch that requieres every note at the temperament. Now just add that little portion to the theoretical frequency of each of the 12 notes, recalibrating the tuner apropriately. Complicated? not really, please read again. As with many things, this is harder to explain than to do. Tune the temperament (F3 – F4) starting at F3 (key number F33) moving upwards one note at a time to F4 (note F45). Remember to recalibrate the tuner at each note as we explained earlier. Once you have finish setting the temperament, tune by octaves the upper part of the keyboard, then the bass section. At this stage I would recommend to tune by ear as the chromatic tuner doesn’t work too well on the low and high section of the piano. This system of tuning a piano with an electronic tuner although not perfect is far superior to just “tune” by replicating the theoretical notes of the piano. Do not forget the importance of a good tuning hammer technic and properly setting pins and strings. 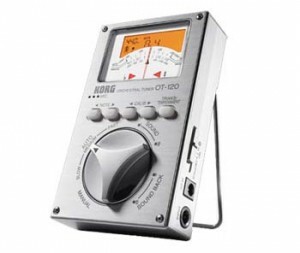 By the way, in case you care to know the cromatic tuner at the header is the “korg OT-120? priced at about 50 US dollars. 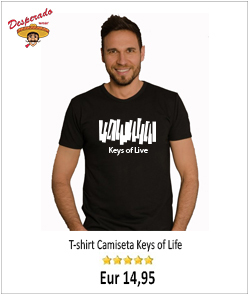 If you are really serious about tuning pianos I would reccomend you to take your time and learn proper aural tuning, or as a second best, to invest in a dedicated electronic or software pro piano tuner, there are some good ones in the market. Calculate and expenditure of about 1000 USD. As to electronic tuning devices, of course we know that the expensive ones have special features like settings which are meant to accurately show the overpull needed for each string to raise pitch in one pass. They also account for the inharmonicity by suggesting stretches which are best for the piano. Something new in the scene is the Entropy piano tuner. This works on a fairly similar basis, listening to partials and calculating the right pitch for each note, although nobody seems to know whether it produces a proper equally tempered scale. The results do seem to be quite good, and apparently a trial has been run where it was found that only the very skilled musician can really tell that it was not an aural tuning. What’s more it’s free. Otherwise I have found AP Tuner to be quite good, it does incorporate basic octave stretching. Without octave stretching I found the frequency it shows on a needle to be very accurate compared with a tone generator. That one is free but with a suggested donation to the author. I think you mentioned about all the tuning devices available, but forgot one, that is the Sanderson Accu Tuner, too expensive and a bit “old fashion” I agree, but probably the best. Anyway, let’s don’t forget that the finest tuner you can have and also the cheapest one, is your own ear!! I have heard of the Sanderson device, and seen photos, it is a stand alone device of course, without the possibility of the graphics available on most display screens. Clearly if systems like Cybertuner, Tunelab, Accu-tuner are able to assess tunings on a piano to RPT exam standards then it must mean they are very good. I agree what you say about your own ear. I have seen it written that 3 strings on a unison could all be the same when measured graphically on their own by a tuning device, but the note could still beat due to the inharmonicity of individual strings being different. You don’t say anything about using the red strip or how it works. Is the middle string supposed to be tuned first? Why is the A the first choice. I read somewhere that the middle string should be tested first. Is the needle on the chromatic device should be in the middle when you know it’s been tuned correctly? What about the first and third string? What ktz should they be tuned? I have a Korg unit. Not the 120 but I believe it’s a 60. I also have the red wool strip and the rubber wedges. I have no idea what to do with the rubber things. I also have the hammer to turn the strings. Can you be a little more specific about how to use these tools? Also, should the needle be in the middle for all the strings to be properly tuned? 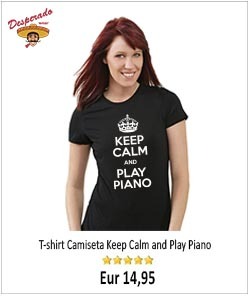 The answer to most of your questions can be find in these two articles: http://howtotuneapiano.com/blog/tuning-easy-and-fast/ and http://howtotuneapiano.com/blog/piano-tuning-procedure/. Please, refer to them. I found a free app that works really well for tuning pianos. It’s called PitchLab. It has preset temperaments as well as being able to create your own. As far as I know PitchLab is fine for tuning guitars but not for pianos, have you tuned a piano with this app? please let us know. I have a Korg OT-120 electronic tuner and want to experience this novel method of piano tuning. in step 3, I don’t get the point about tuning a certain note to a certain frequency. I don’t see any button on my tuner to show me the frequency of a note! for example the frequency of F33 that is 174, 614 htz. Thanks for your post. Yes, is not so easy to find a competent piano tuner as it used to be. I know many people who have learn to tune their own piano, after all is not so terribly difficult as some people think. I am happy to know that this site can help you. I would like to say thank you for your article on electronic tuners. I am tired of waiting for piano tuners to tune my piano as they are like gold dust in West Cornwall, England UK. I am now gathering knowledge and information along with confidence to tune my baby grand piano. So every piece of information helps.